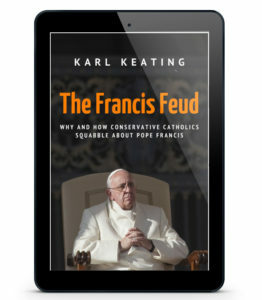 I'm launching my newest book, The Francis Feud, and I'm making it available at a special price of just $3.99 for the ebook version, as a courtesy to those who saw my appearance on EWTN on June 13—and to those who didn't, for that matter. When is it proper to criticize a reigning pope? Is it ever—or never—proper? Might it be sometimes proper, even if not always proper? And is proper even the right word? The term suggests something right or permissible but not necessary or compelled. Perhaps the question should be: when is it necessary to criticize a reigning pope? If there are necessary times, who should do the criticizing—high-level Churchmen, well-degreed academics, well-read laymen—maybe even the Catholic next door who has a gripe? Those are some of the questions examined in the following pages, which are organized around three recently-published books that view Pope Francis critically: Henry Sire’s The Dictator Pope, Philip F. Lawler’s Lost Shepherd, and Ross Douthat’s To Change the Church. Their arguments are presented and discussed partly in their own words and partly in the words of their reviewers, supporters, and opponents—and partly in my words because I have been both an observer and a participant. What has fascinated me has been the rhetoric. Usually that term has a negative connotation. We tend to think that someone who "uses rhetoric" is just mouthing off. But rhetoric has an honorable pedigree. From the time of the ancients until just a few decades ago, it was understood to be the art of persuasive speech. How do we get people to accept our take on things, when syllogisms alone aren't enough? What constitute a good argument—or a bad one? In The Francis Feud I look at arguments from all sides—or, at least, as given along the spectrum of what I call "conservative Catholics," using that term in a wide sense. I look at those who criticize Pope Francis, whether mildly or severely, and at those who defend him, whether with occasional reservations or without any exceptions. I think I've presented all the participants fairly. I hope I have, because some of them are long-time friends of mine and others are, at least, acquaintances. I have tried to be generous in quoting, so as not to take anything out of context, especially when I end up disagreeing with it (which is fairly often). Whatever your own take on these matters, I think you'll find The Francis Feud to be a stimulus to further reflection. If you profit from it, I hope you will do me the favor of leaving a review at Amazon. It's through reviews that authors find many of their future readers.